Yes I’m afraid so and this salvia is once more irresistibly beautiful. 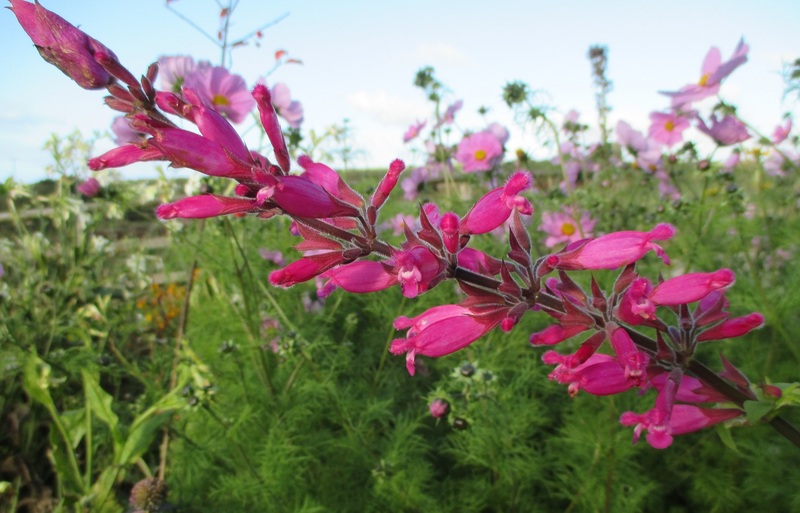 Here we have the shocking pink Salvia involucrata, a native of Mexico and sometimes known as the roseleaf sage. What it lacks in hardiness it makes up for in vigour, growing up to 1.75m in a season before flowering. Once it starts to bloom there is no stopping its profusion, providing a welcome blast of colour as the light diminishes. Cuttings have been taken as an insurance policy against its arch nemesis, the frost. If this one makes it through the winter it will be even more superb next year. If not, one of its greenhouse cosseted offspring will take its place. The circle will be complete. Love this and it looks great with Dahlia ‘Blue Bayou’. mmmm I just love salvias. Never enough. So true, it is a very worthy addiction! Beautiful with the cosmos behind it. I’ve just brought a Tibouchina inside, as it will not survive temperatures less than 5 deg. C., and we might get those kinds of lows any time now. You have a tibouchina, you lucky lady! I saw one the other day that was very pale, almost white, not sure that I liked it as much. Our parks department includes these lovely trees in many of their plantings. I’d been wanting one for several years, but they were too pricey. This summer, I saw one I could afford (on sale, $19.99!). I’ve got it in a pot and kept watching to see when the parks department would take theirs in. Now it’s inside the house, in full bloom. I really should look into acquiring a greenhouse! Looking forward to seeing the painting! Never realised what a wonderful family of plants this, this one is lovely.